After leaving Hattoji, I went to Ushimado, which is on the Seto inland sea, the body of water that separates Honshu from Shikoku. 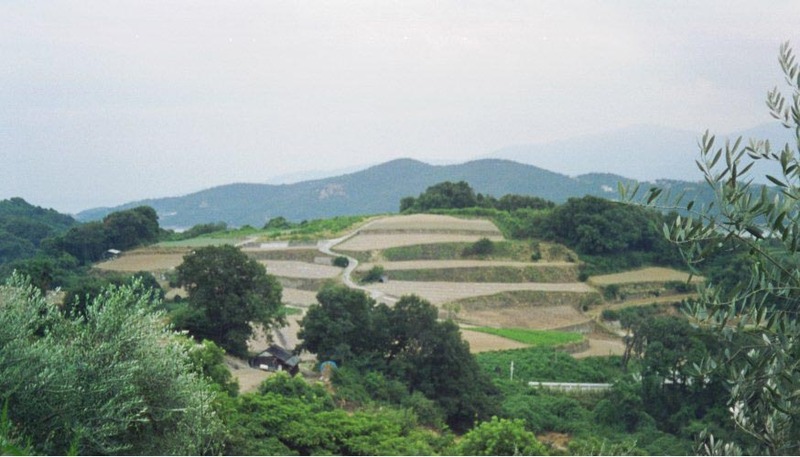 The tourist brochures all call this area "The Aegean of Japan", which seems reasonable given the terraced hillsides and the seaside town. Another good justification for that moniker is that it looks like the area is a powerful tourist magnet in the summer. 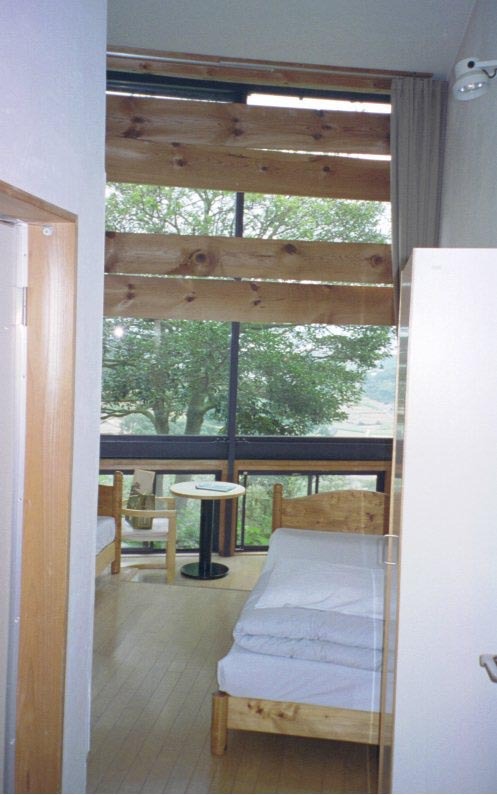 This is a picture of the incredibly pretentious "Hotel Limoni" in Ushimado. 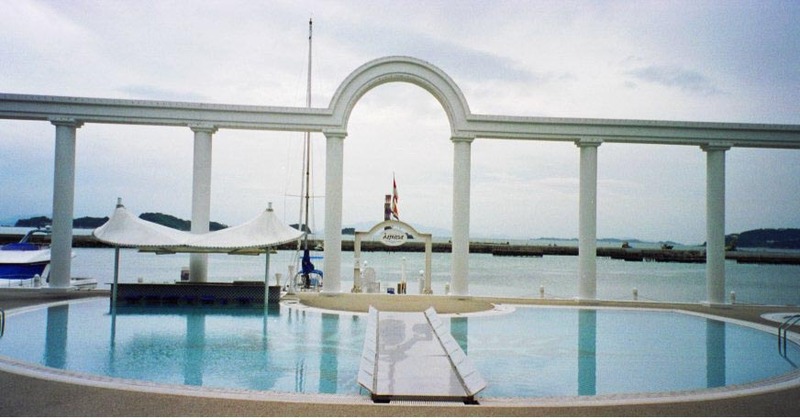 This amazing faux Greek courtyard is apparently there to lure Japanese couple to have their weddings here -- and it's apparently pretty successful. When you walk in to the lobby of the hotel, the counter on one side is 'guest registration' and the counter on the other is 'wedding party registration'. That misty land out there is Shikoku, the "fourth" island of Japan. This was my room at the International Villa in Ushimado. Nice enough, but pretty much built like a modern ski lodge anywhere in the world -- definitely not as intriguing as the Villa in Hattoji. 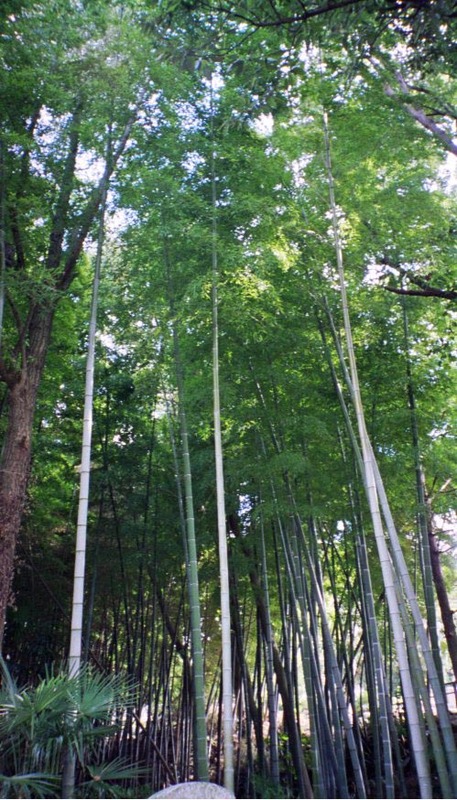 This was a very nice bamboo grove I found in town near the Kyoozan Honrenji temple. 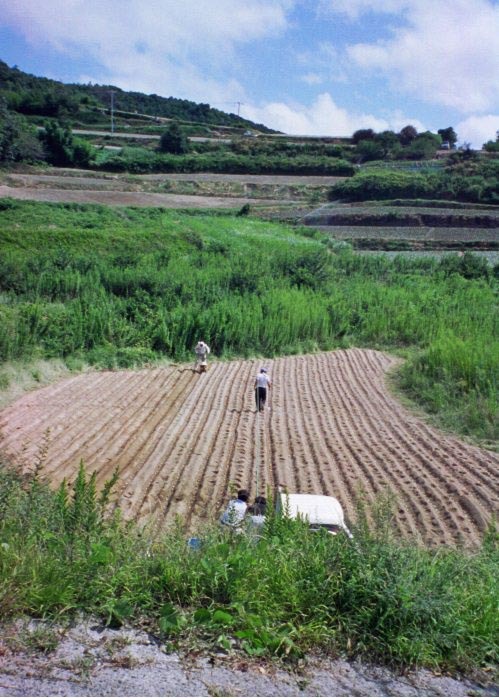 Here's a typical view of Japanese agriculture: a tiny (by American standards) field, with a group of native Japanese working it by hand. Most of the rice agriculture I saw was practiced by hand; most of the vegetable farming, etc. was the same. Perhaps that's why food in the grocery store was the only thing that really struck me as hideously expensive on this trip. A 10 lb. (5 kilo) sack of rice was $25 at the store; I bought a $2.75 apple for a snack one day; etc. 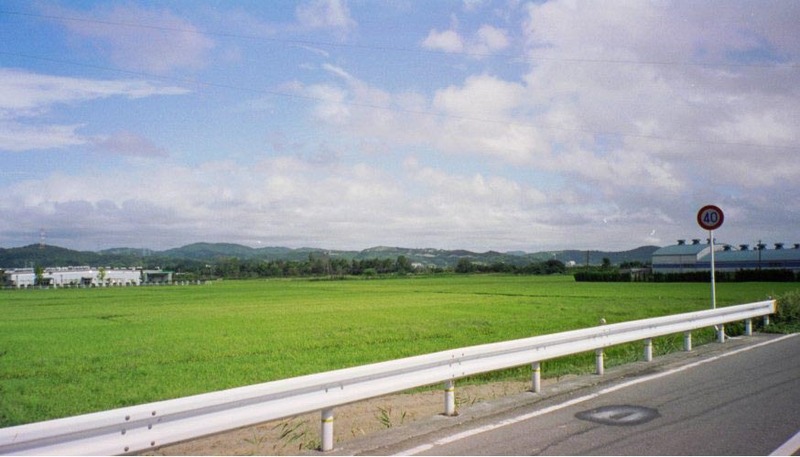 This was one of the biggest rice fields I saw in Japan, on the western edge of Ushimado. At right is another beautiful roadside garden, in someone's front lawn, three feet from a narrow, busy street.